"Seeing then that we have a great High Priest who has passed through the heavens, Jesus the Son of God, let us hold fast our confession. For we do not have a High Priest who cannot sympathize with our weaknesses, but was in all points tempted as we are, yet without sin. Let us therefore come boldly to the throne of grace, that we may obtain mercy and find grace to help in time of need" (Heb. 4:14-16). "Let no one say when he is tempted, “I am tempted by God”; for God cannot be tempted by evil, nor does He Himself tempt anyone. 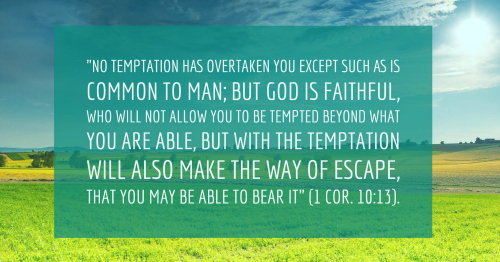 But each one is tempted when he is drawn away by his own desires and enticed. Then, when desire has conceived, it gives birth to sin; and sin, when it is full-grown, brings forth death" (James 1:13-15). "Do not be wise in your own eyes; Fear the Lord and depart from evil. It will be health to your flesh, And strength to your bones" (Prov. 3:7-8).